Don't Turn Your Nose Up At A Stinky Cheese The colorful rinds and pungent odors of a washed-rind cheese can be off-putting. But hidden inside is a sweet, creamy treat that transforms classic comfort foods. Get recipes for Epoisses Polenta Pizzas With Oil-Cured Olives And Rosemary, Taleggio Grilled Cheese Sandwich With Arugula And Caramelized Onions and Red Hawk Double-Baked Potatoes. Washed-rind cheeses melt like a dream and incorporate seamlessly into dishes. Their earthy funk adds flair to mild foods. ... These are cheeses that inspire cooks. If you pass on cheeses based on their scent, you may miss some of the best. Even though washed-rind cheeses, with perfume described in wine as "barnyard," can be off-putting to many eaters, the cheeses with the funkiest smell often have the sweetest centers. This pungent genre of cheeses with orange, brownish or pink washed rinds are noted for their flavor. Although some firm cheeses are in this category, the washed rinds that get the most attention are those with soft, often oozing centers. Cow's milk versions commonly available at stores or through mail order include Italy's Taleggio and the French Epoisses. Washed-rind cheeses are an emerging industry in the U.S. but are available — including Grayson from Meadow Creek in Virginia and Red Hawk from Cowgirl Creamery in California. 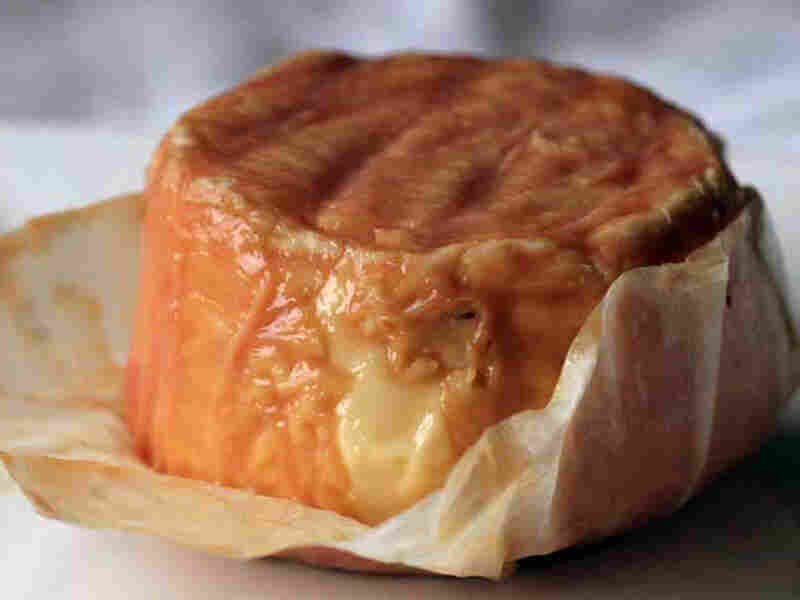 Washed-rind cheeses with orange, brownish or pink coating — like this Epoisses from France — are known for their "barnyard" odors and pungent flavors. Washed-rind cheeses melt like a dream and incorporate seamlessly into dishes. Their earthy funk adds flair to mild foods, and as they cook, the silkier ones form a sauce that coats food in a film of smooth, creamy luxury. These are cheeses that inspire cooks. They're called "washed-rind" because as they mature, their rinds are washed or rubbed with a brine, usually a blend of water and salt or alcohol. Like the traditional marc de Bourgogne blend used to wash down Epoisses, the brine encourages the growth of Brevibacterium linens. These good bacteria work to keep harmful bacteria at bay and to develop an earthy, meaty, sweet character in the cheese. Thank a monk for this discovery. During the Middle Ages, Trappist monks in Europe began rubbing the beer and spirits for which their establishments were celebrated on their cheeses to keep the rinds from cracking. They found that another result of moist brining was a full-bodied, sweet albeit stinky cheese that earned space on their plates during meat fasts. Cheese makers keep the curds large so less water and whey drain, and the cheeses stay moist and tender. Once you've tried a washed-rind cheese, it's difficult — even for those with the most finicky of noses — to turn one down. Focusing mainly on cheese, Kirstin Jackson is an Oakland, Calif.-based food writer, professional cook, and food and wine consultant. When not teaching classes at the San Francisco Cheese School or Solano Cellars, her fromage musings can be found on her blog It's Not You, It's Brie (a book by the same name is in the works) and on Twitter. Because washed rinds were traditionally Trappist cheeses, it is not surprising that they pair well with beer. The monks who make these cheeses are also master brewers and would naturally want their two creations to taste good together. I like them best with Trappist beers, but they go well with Belgian beers in general, whose slight sweetness plays off the flavors in the washed rind's interior. Pairing with wine is simple, too. Aromatic whites are generally the way to go. Off-dry Gewurztraminers, Rieslings and lightly oaked Viogniers work like Belgian beers to highlight the cheese's sweetness. Reds are harder because a washed rind's pungent nature demands attention and doesn't always play fair with red or black fruits and tannins. If determined to go red, aim for high-acidity wines with low oak, such as gamay, pinot noir, barbera and nebbiolo. If the cheese is European, it goes especially well with the wines of the region or neighboring areas. Epoisses loves pinot noirs and chardonnays from the Burgundy area where it grew up, for example. So hold your nose if you must, but try not to judge a cheese by its odor. If it's too strong for you on its own, try easing into a good washed rind with a recipe that incorporates it into a classic dish. 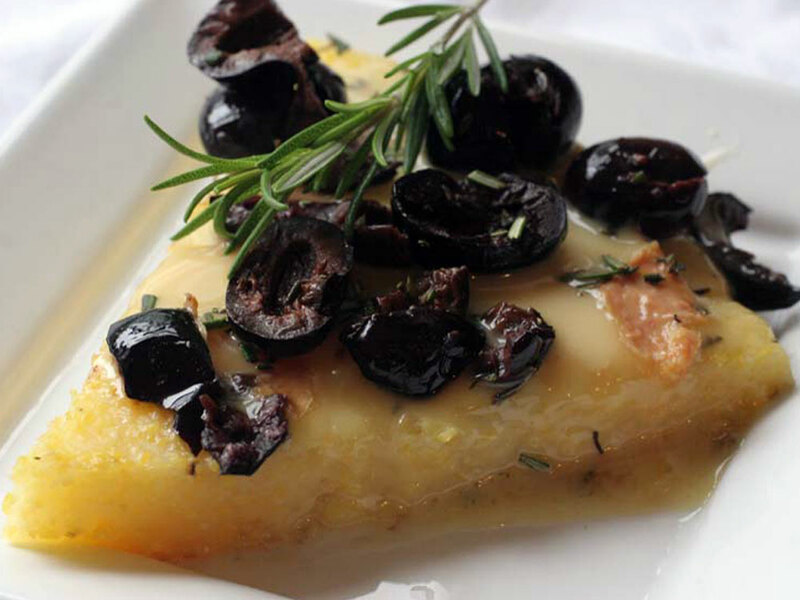 The Epoisses adds an earthy, salty flavor to this otherwise simple polenta dish. Don't be tempted to use more than the suggested amount of cheese — a little of this washed rind goes a long way. I serve this as a main course, with a green salad and walnuts. Because the polenta is somewhat soft, it is meant to be eaten with a fork. If you'd like to serve this as an appetizer or hors d'oeuvres, simply cut into smaller pieces. Put water, polenta and salt in a medium saucepan and whisk vigorously to break up polenta clumps. Bring to a boil, then lower to a simmer and add the chili, bay leaves and rosemary sprig. Stir frequently so polenta stays smooth and does not scorch on pan bottom. Cook for 20 minutes, or until polenta grains are soft but not mushy. While warm, pour into an 8-inch springform cake pan lined with waxed parchment paper. Remove the herbs and chili and tap pan on countertop to help smooth. Cool. Pit olives by turning the blade of a large chef's knife so it is parallel to a cutting board, placing two or three olives underneath the blade and carefully pressing your palm down on the thickest part of the blade near the handle until the fruit breaks. Then remove the pits. Roughly chop half the olives. On top of the cooled polenta, place a layer of the sliced Epoisses. Scatter olives and chopped rosemary over the top and heat in oven for 5 to 10 minutes, until the cheese is melted. Remove from pan and serve. 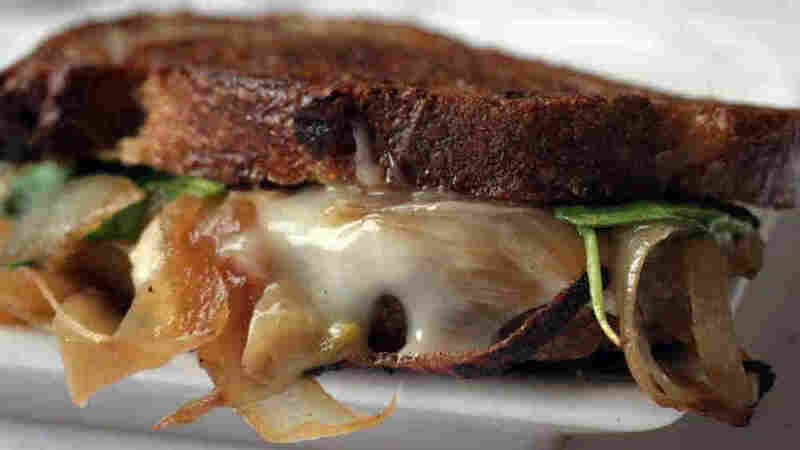 In this sandwich, melted Taleggio makes one of the creamiest grilled cheeses you will ever taste. 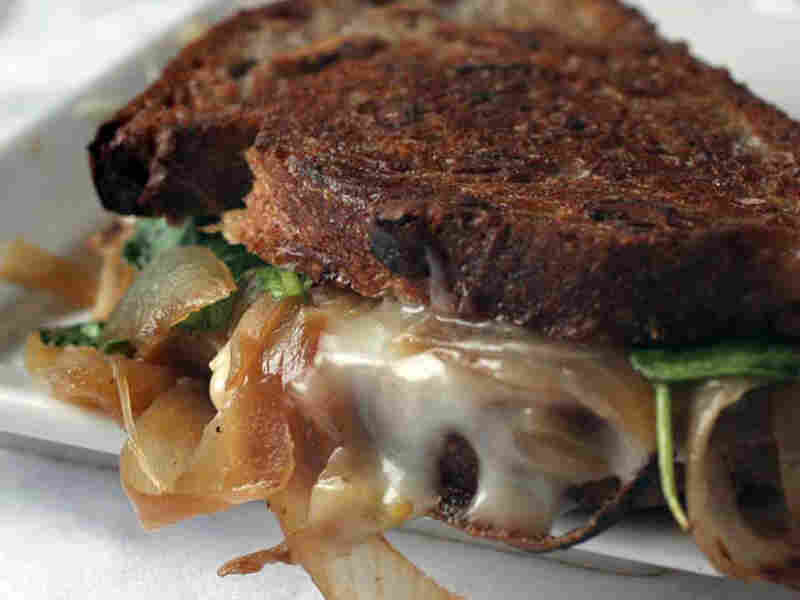 Offset by the sweetness of the caramelized onions and peppery arugula, the flavors are perfectly balanced. The crunch offered by country wheat and walnut bread only sweetens the deal. I used a supermarket walnut loaf, but any rustic, hearty, artisan bread will do. If you have leftover caramelized onions, toss them on a polenta pizza the next day. Begin cooking onions in canola oil in a medium-sized saute pan over high heat for 5 minutes, stirring frequently. Lower heat and cook for 20 minutes, or until onions are caramelized and sweet tasting, stirring occasionally. Add up to 2 tablespoons of water to onions when necessary to prevent burning and sticking. Let cool. Toss arugula with olive oil in a separate bowl. Spread 1/2 tablespoon of butter on one side of each bread slice, using 2 tablespoons total. Begin building one sandwich by spreading 1/2 tablespoon of butter on the unbuttered side of one of the bread slices. Layer half the arugula on top of the butter, followed by half of the Taleggio and half of the caramelized onions. Top with another piece of bread, buttered side up. Repeat steps for the second sandwich. In a medium saute pan over low-medium heat, melt the remaining tablespoon of butter and add the sandwiches, arugula side down. Resist the urge to flip until the first side is golden brown, 4 to 5 minutes. Flip, turn heat to low, salt the top slice of bread, and wait until the second side is golden brown, about 5 minutes. Serve immediately. 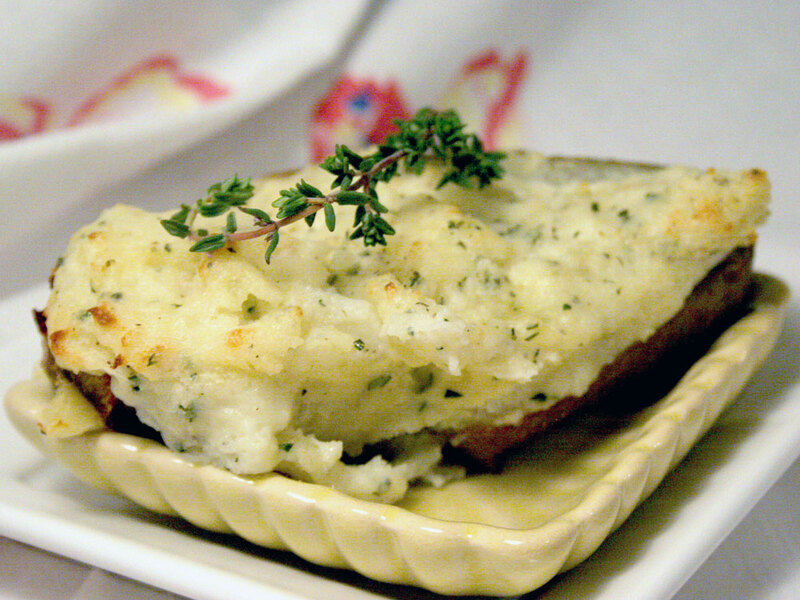 The tangy, sweet Red Hawk and herbs brighten up a normally heavy potato dish. This is a classic dish, so keep it simple, and serve with a vegetable side and steak, or a simple pasta for vegetarians. Red Hawk is available in specialty stores and online, or you could substitute Saint-Nectaire. Prick the potato skins 5 or 6 times with a fork so steam will escape, and bake for 45 minutes to an hour, or until a table knife inserted slides out easily. Set aside until cool to touch. Cut potatoes in half lengthwise and gently scoop out centers into a medium-sized bowl, leaving a little flesh behind and trying not to break the skin. Add the cheese, sour cream, butter and herbs to the bowl and mix well. Salt and pepper to taste. Spoon a quarter of the potato mixture into each potato skin. Bake for 15 minutes, until golden brown. Cool for 5 minutes and serve.